Earth Defense Force 2017, the first game in the series to grace American shelves, was a bit of an impulse buy. I picked it up because my wife had heard good things about it and it was, well, it was pretty cheap. I think it launched at 30 bucks or so, which compared very well to the average $60 Xbox 360 game. It was one of my best purchases for the console. It wasn’t a terribly complex game – pretty much every level was “You are in the middle of a crudely-modeled Japanese city, surrounded by giant insects and mecha. Here are some large guns. Do what seems appropriate.” – but it was undiluted fun. The sequel, Insect Armageddon, had more of a story and spent more time working on a leveling system and adding complexity, but it lost a lot of that undiluted fun in the process. 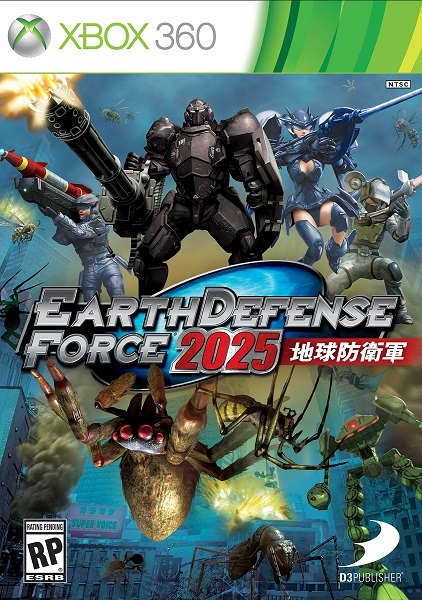 Thankfully, EDF 2025 completely ignores all of the changes made for Insect Armageddon and goes back to the formula of giant insects + lots of guns + destructible environments + over-the-top physics = fun as all get out. There is something joyous about seeing a skyscraper crawling with 30-foot-long fire ants, hitting it with a big rocket, and watching pieces of ants fly everywhere while the building collapses. It’s taken me a solid week to play through on Normal difficulty with one of the game’s four classes. It has 85 levels in offline mode – with more available as DLC and when playing online – and I needed to play some of the earlier levels on higher difficulty settings to get better weapons to tackle the higher levels on Normal. It also took me nearly two hours to get through the last level, which is a three-stage boss fight sort of affair where the “boss” is big enough to cover the entire sky and your progress in the fight can be tracked by the amount of sunlight you start letting through as you blast away at it. That was a single play-through, and there are achievements for each of the four classes on all five difficulty levels. That’s a minimum of 1700 levels played for 100% completion. There is a LOT of game here for the completionist. I am NOT one of those so I will happily put it on the shelf and pat myself on the back for my efforts in high-impact pest control. As with the previous games, this is not for anyone with the slightest hint of arachnophobia. Anyone else should check it out.